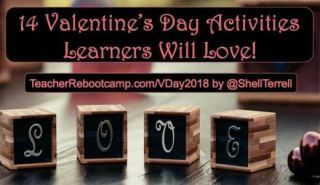 14 Ways Students Can Celebrate Valentine’s Day! Students can send free digital greetings to their loved ones, peers, another class, nursing homes, cancer wards, orphanages, or the military with Buncee, Chatterpix Kids app, Ink Cards, Animoto, Canva, Magisto, Pic-Collage, 123Greetings, or Red Stamp. First, allow them to create their messages or poems on paper and have their peers edit for grammar errors. Students can add drawings or photos to many of these web tools and apps. If you’d teach math then your students can send Math-o-grams with cool heart designs graphed. Students can see the equation worked out. Students can learn cryptology by turning their Valentine’s Day message into a coded message or rebus for peers to decypher. Try MyRebus where students create quick virtual rebus messages to email. If you have more time then use this lesson plan to get students to create their own secret coded language. Very young learners will enjoy learning words, spelling, and phonics by creating digital greetings on Starfall to send to fun characters. For some grammar and fun try playing the Valentine’s Day inspired M.A.S.H game on iOS and Android. Use candy hearts as writing prompts. Students choose 3 to 5 and include the words in a poem or story. Another idea is to break students into pairs, they choose 3 to 5 candy hearts, and then they write a dialogue or text message conversation including the words. They can try this free sms chat generator created by Class Tools! Instead of eating the candy hearts, you can instruct your elementary students to save them to learn science with this candy hearts experiment. Challenge: Try one of these activities with your students! Post more ideas in the comments below.